The flamebacks or goldenbacks are large woodpeckers which are resident breeders in tropical southern Asia. They derive their English names from their golden or crimson backs. The Great spotted woodpecker ( Dendrocopos major) exists in Europe, northern Africa and northern Asia and most of the world population is sedentary except those that breed in the coldest northern parts of its range. TAGS: Bird painting of Great Spotted Woodpecker, bird sketch of Great Spotted Woodpecker, bird drawing of Great Spotted Woodpecker, bird art of Great Spotted Woodpecker, bird illustration of Great Spotted Woodpecker. The Green Woodpecker (Picus viridis) is a bird that occurs in the west, and southwest Asia, and in most of Europe except on some islands in the north and is one of the most common woodpeckers in Europe. 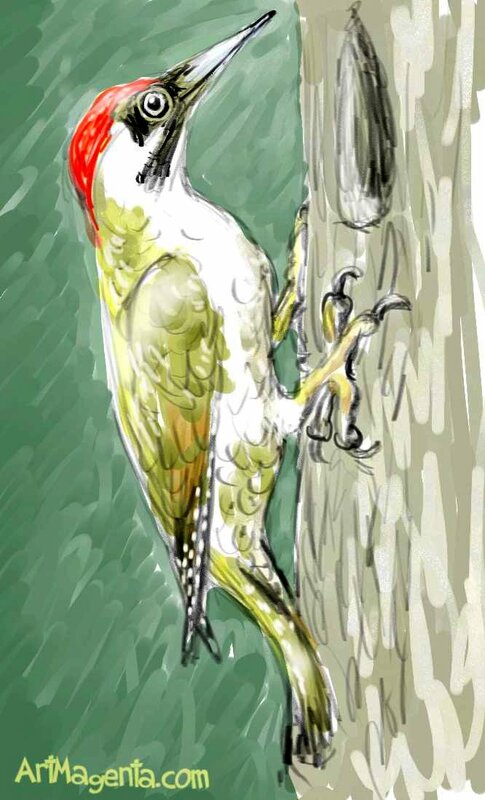 TAGS: Bird painting of Green Woodpecker, bird sketch of Green Woodpecker, bird drawing of Green Woodpecker, bird art of Green Woodpecker, bird illustration of Green Woodpecker. The Northern Flicker (Colaptes auratus) is native to most of North America, parts of Central America, Cuba, the Cayman Islands, and is one of the few woodpecker species that migrate. TAGS: Bird painting of Common Flicker, bird sketch of Common Flicker, bird drawing of Common Flicker, bird art of Common Flicker, bird illustration of Common Flicker. The White-backed Woodpecker (Dendrocopos leucotos) live mainly in the Palaearctic. Its range extends from southern and central Scandinavia, over eastern Europe, in a belt east to Japan and the Kamchatka Peninsula. The distribution area's center lies in the southern taiga. In Europe there are surviving populations in the Pyrenees, the Alps and the Carpathians, in the southern Apennines and in the southwestern part of the Balkan Peninsula. TAGS: Bird painting of White-backed Woodpecker, bird sketch of White-backed Woodpecker, bird drawing of White-backed Woodpecker, bird art of White-backed Woodpecker, bird illustration of White-backed Woodpecker. Grey-headed Woodpecker (Picus canus) is a Eurasian woodpecker that has its distribution in Europe and Asia and is resident throughout its range. The pileated woodpecker (Hylatomus pileatus) is a very large North American woodpecker, roughly crow-sized, inhabiting deciduous forests in eastern North America, the Great Lakes, the boreal forests of Canada, and parts of the Pacific coast. Three-toed Woodpecker (Picoides tridactylus) has circumpolar distribution in the taiga throughout the Holarctic. It breeds throughout the northern coniferous forest belt of north-eastern Poland, the Baltic states and central Scandinavia, east to Kamchatka, Sakhalin and Hokkaido. Lesser Spotted Woodpecker (Dendrocopos minor) has its distribution throughout the western and northern Palearctic into Asia's Pacific coast. Black Woodpecker (Dryocopus martius) lives in mature forest across the northern Palearctic. The woodpeccker's range is expanding into Eurasia. It does not migrate. The middle spotted woodpecker (Leiopicus medius) occurs only in Europe and southwest Asia, from northern Spain and France east to Poland and Ukraine, and south to central Italy. The Wryneck (Jynx torquilla) is a woodpecker that lives in Eurasia and North Africa. The Wryneck winters in tropical Africa and South Asia. The red-headed woodpecker (Melanerpes erythrocephalus) bteed across southern Canada and the eastern-central United States. TAGS: Bird painting of red-headed woodpecker bird sketch of red-headed woodpecker, bird drawing of red-headed woodpecker bird art of red-headed woodpecker, bird illustration of red-headed woodpecker.